You’ve no doubt heard about astrology. Who hasn’t? But the popular perceptions of this extraordinary science are so erroneous and misguided that it’s safe to say that the general public has never had access to the facts of the subject. 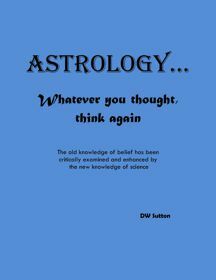 So, Astrology…whatever you thought, think again explodes the myths and explains the facts. 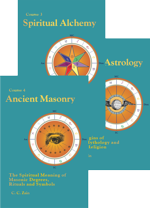 This book allows you to boost your understanding and to re-think your ideas about the science of the soul and stars at a time when its subject matter is widely discredited and flagrantly abused. 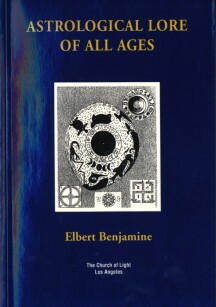 The definitive work on astrological research! This work presents statistical guidlines for interpreting both natal and progressed positions. 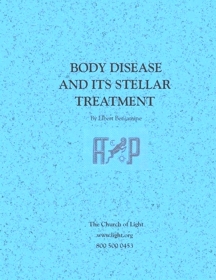 It is the only currently-available source of the statistical research done by The Church of Light Astrological Research Department, under the direction of Elbert Benjamine(aka C.C. Zain). 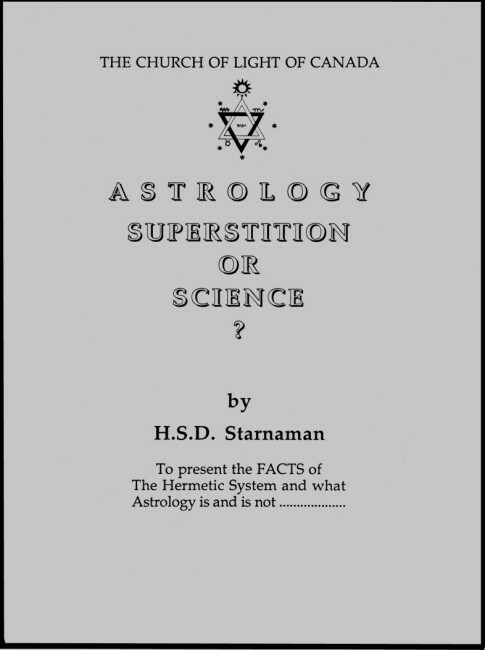 No astrologer’s library is complete without this volume. 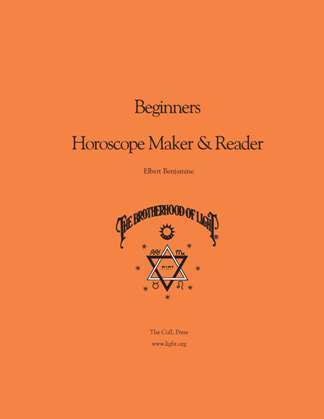 This book was originally published by The Aries Press, Chicago, Illinois, in 1943 as two volumes: Beginner's Horoscope Maker and Beginner's Horoscope Reader. Both were authored by Elbert Benjamine. Part One, the “Maker” was written at a time when astrological charts were calculated by hand using, what at the time, was simple mathematics. Today computers are faster and more accurate than performing the tedious hand-calculations. 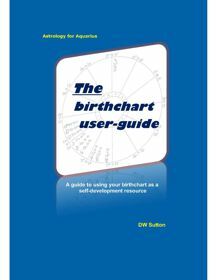 However, for anyone seeking a thorough understanding of aspects and the finer nuances of chart interpretation, it can be very helpful to understand the math and Beginning Horoscope Maker is helpful in this regard. 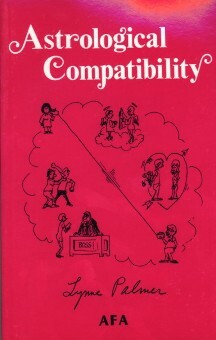 In 1972 the two volumes were combined into one book, Beginner's Horoscope Maker & Reader. The 1972 version is here presented in its entirety. 182 pages - Downloadable PDF eBook. 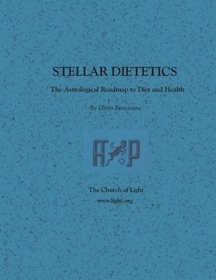 The grand dame of astrology, as she was dubbed in a Life magazine article, has put together a tasty repast with all the right ingredients. In her deft filigree combination of the three the reader soon realizes the close interrelationship of these three subjects ... and in doing so will greatly improve their ability to interpret card readings and the hidden influence of names and numbers. 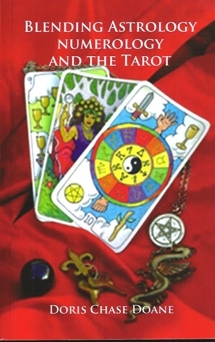 Here is an up-to-date book containing an easy and enlightening approach to getting the most out of reading tarot cards. 14 diiferent spreads using keywords to give a smooth, informative interpretation for every card in the tarot deck. 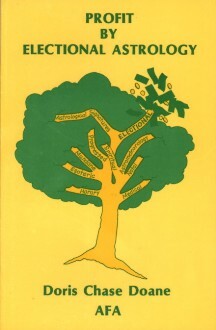 This book is filled with information, a great reference book. This book is an essential tool for those who want to learn to read the cards of The Brotherhood of Light Deck in spreads. 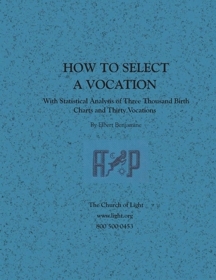 How-to Manual for assessing Birth Charts using Church of Light Astrodynes. Astrodynes is a technique developed by Elbert Benjamine and the Church of Light, for precise determination of the astrological power and harmony or discord of any planet, aspect, sign or house in an astrological chart. 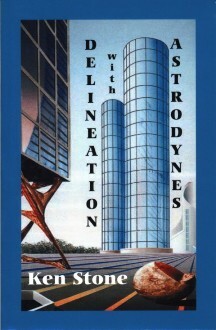 The use of Astrodynes provides a method that greatly facilitates astrological analysis in all departments of life, and is one of most important astrological tools developed in modern times. 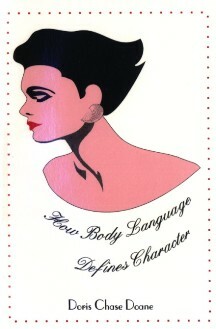 Learn to interpret dominant factors for health, compatibility, vocation and more. 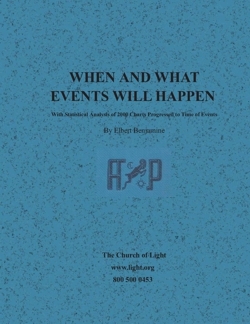 Written by past Church of Light President. 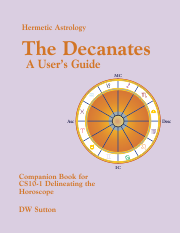 This book contains five example charts of notable people for each of the 36 decanates (10 degree section) of the zodiac - 180 comtemporary notable nativities sorted and analyzed by decanate. 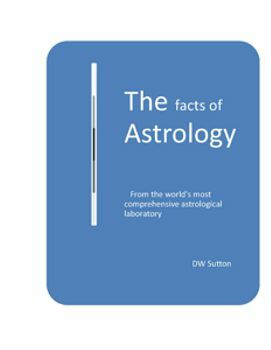 It is a valuable companion to CS 10-1 Delineating the Horoscope because it supplements the information in the first two chapters on the decanates. 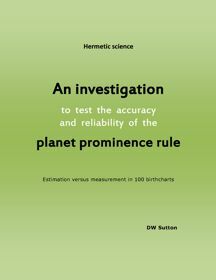 Sutton's book, however, contains contemporary notable personalities, and the charts are all Rodden-rated for authenticity. Profiles of 26 well known women of the 21st century. Analysis of the body through astrological correspondences. How to apply techniques to make most of the social, intellectual or romantic situations. 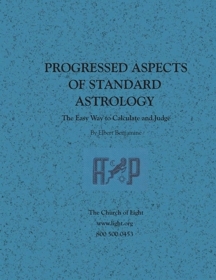 Astrology in action, usable for people in all walks of life. 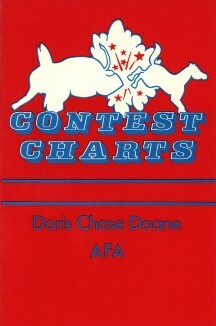 An excellent book on how to delineate and interpret a chart using Astrodynes. 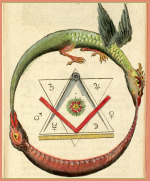 Astrodynes are a method developed by the Church of Light for quantifying the power, hamony and discord of planets, signs and houses in an astrological chart based on house position and planetary aspects. 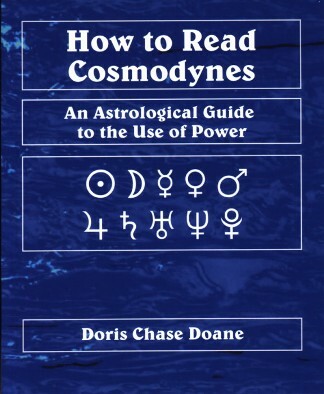 Doris, often called the Grand Dame of astrology and member of the Church of Light Board of Directors before her passing, uses the term Cosmodynes in place of Astrodynes, but the methods are identical. She became involved with the Church of Light in 1941, working there and through study became a Hermetician. In 1943, she attended UCLA and majored in psychology and sociology, discovering her facility with writing. She met Edward Doane, whom she married in 1944. She and Ed worked at the Church of Light Headquarters, providing service through teaching, research, grading papers, processing orders, and overseeing printing production. 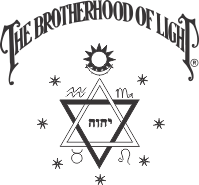 Their support at the Headquarters allowed Elbert Benjamine (CCZain) the freedom to tour the country in the post-war II promotion of Brotherhood of Light teachings. She became President of the Church of Light and also served on the Board of Directors. She was also president of the AFA in 1979 and served in this capacity until 2004. 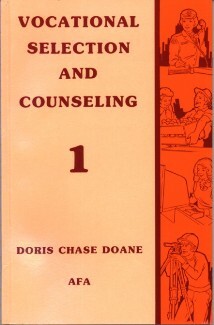 This book explains the many options a person has when considering a serious life change. 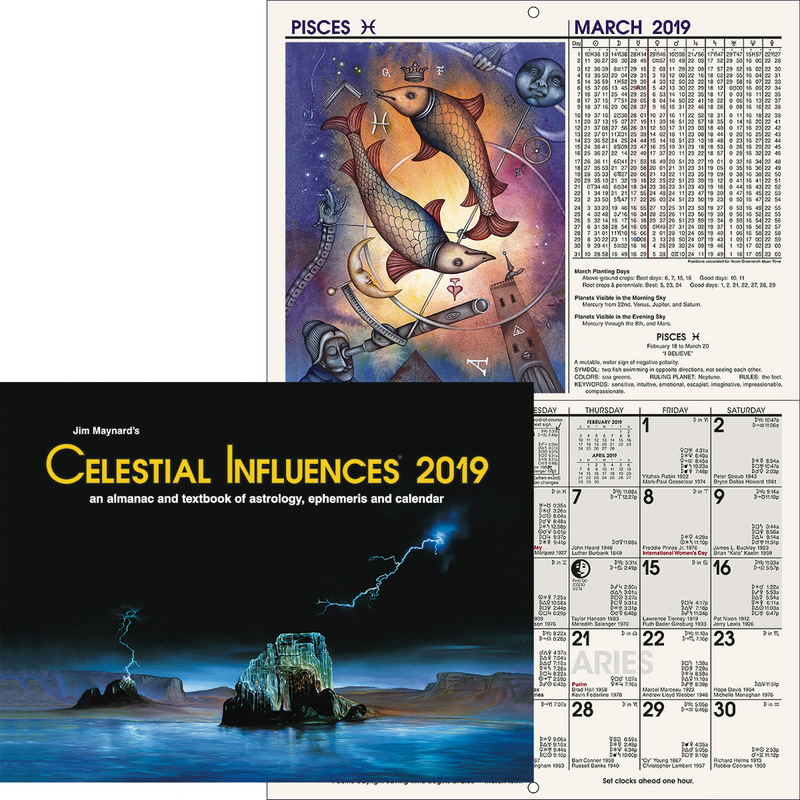 Electional charts a drawn for an "astrologically propitious" time in the future, identifying the best time to do something important. 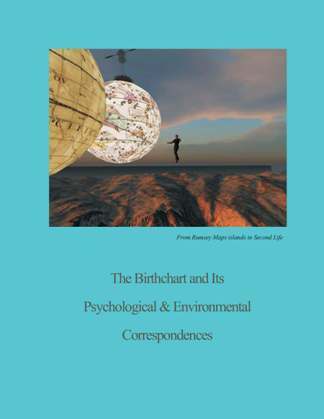 Addressing these circumstances, this book covers a wide range of subjects. Over 60 charts representing a variety of events are used to point out how to find the best time making certain changes in your life or beginning some new venture. 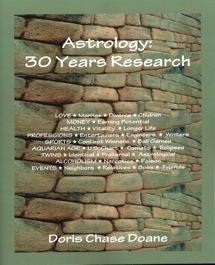 Doris does a great job of interweaving electional astrology with natal astrology and related disciplines. 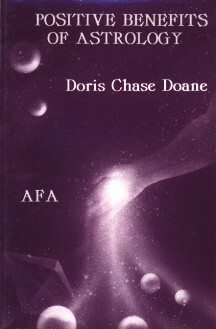 Doris Chase Doane, the Grand Dame of astrology, takes you on a journey through life. 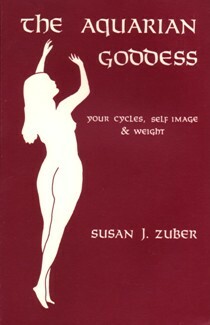 She shows how the use of astrology can help solve many of life’s problems. In so doing we learn about the way we justify our mistakes, compound our errors and magnify our difficulties. But wait: She explains the way out. 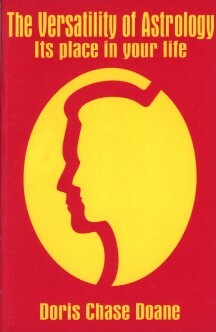 This book is full of direct solutions and answers. The vocational area is one of the most important that a professional astrologer has to deal with today.Almost every client will ask about this important life subject. These books are just as important for students. 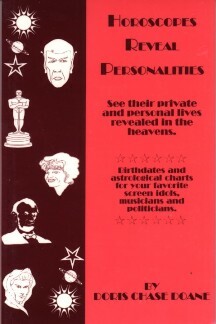 Vol 1 focuses on individual horoscope career factors with emphasis on aptitude, motivation, income potential and avocations. 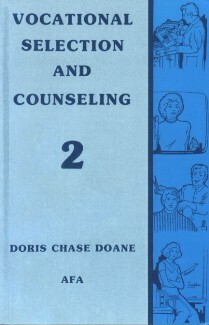 Vol 2 shows how to synthesize the many astrological factors to help clients make the best career choices and is an excellent resource for the counseling astrologer.